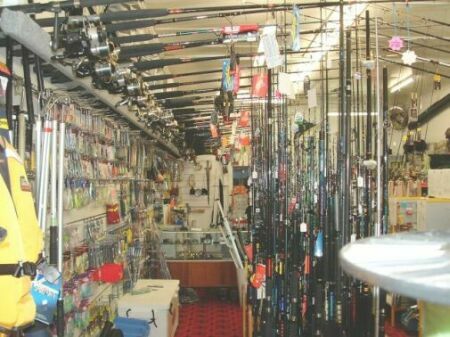 DiscountFishingSupplies.co.nz (DFS) is wholly owned by Caroline Fishing 2001 Ltd (Company Registration HN/1122084), Having its registered office situated at 15 Elsdon Best St, Gisborne. Postal Address is: P.O. Box 855 Gisborne New Zealand. Ph 06 8632902 . We also have a Shop DISCOUNT FISHING SUPPLIES situated at 441 Gladstone Rd Gisborne. If you live in Gisborne or pass through please come in and see what the Deal of the day is. We look forward to meeting you. NZ GST TAX of 15% is included in all prices (GST Registration Number: 78-638-729) For all orders with a shipping address of any country outside of New Zealand, the GST will automatically be removed when making the order, as International customers are not required to pay our GST TAX. Monday to Friday - 9am to 5.30pm. Saturday - 9am to 2pm, Sunday - Product Testing Day. The best time to phone for an uninterrupted chat (06 8632902) is from 8 to 9am or 5.30 to 6.30pm. However, if we can't attend to your call, please leave a message on our answer service and we will respond ASAP. There is No such thing as Strangers. Strangers are just friends we haven't met yet! Managing Director is: Captain Colin Kerr. (Photo below of me with a nice Bass caught at Thunder rock Off Gizzy 11-09-2010. Caught off Charter Boat "Legend" Owned and Skippered by Steve Cullingford)). My Deep Water Gear is a CD Titan Plumb Fibre 24kg Rod with a Quantum Aruba 30W 2speed reel and Aftco Gimbal and Harness Set. Which all goes to make the deep fishing a breeze! I (Captain Colin Kerr) have spent the last 20 years on the sea fishing for large Tuna, Broadbill and Groper. I have caught Northern Bluefin of 370kg+ within 35 miles of Gisborne breakwater. In 2004 I caught the world's southernmost Wahoo, south of Cape Kidnappers. The fish is now in the National Museum - Te Papa. I have sent many fish to Te Papa including 2 Broadbill which became specimen 1 and specimen 2 of our national fish collection. 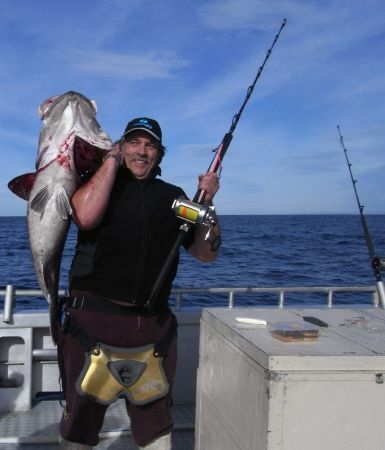 Being brought up within a mile of Gisborne wharf, I have fished all my life and have a vast experience in finding and catching large fish off the East Coast of the North island of New Zealand. And I happily share my knowledge with my many customers. I offer good sound advice on both appropriate fishing tackle AND location, and as I have slept thousands of nights on the briny - I also have extensive knowledge of safety aspects of putting to sea. Our mission is to supply you the Kiwi Fisherman with the FAIREST PRICED fishing tackle & equipment available in New Zealand PLUS PROVIDE YOU WITH TOP SERVICE. All goods will carry full manufacturer service and replacement warranty. Where there is a problem with the wholesalers or importers - we will sort it out for you. That is our promise. We are more than happy for mediation to resolve any disputes that may arise. Thank you for taking the time to read. Please enjoy your shopping and more importantly enjoy your FISHING.